While it is possible to change user permissions on a user basis, it is strongly recommended to use groups instead. Just as for users, there are "Backend user groups" and "Frontend user groups". 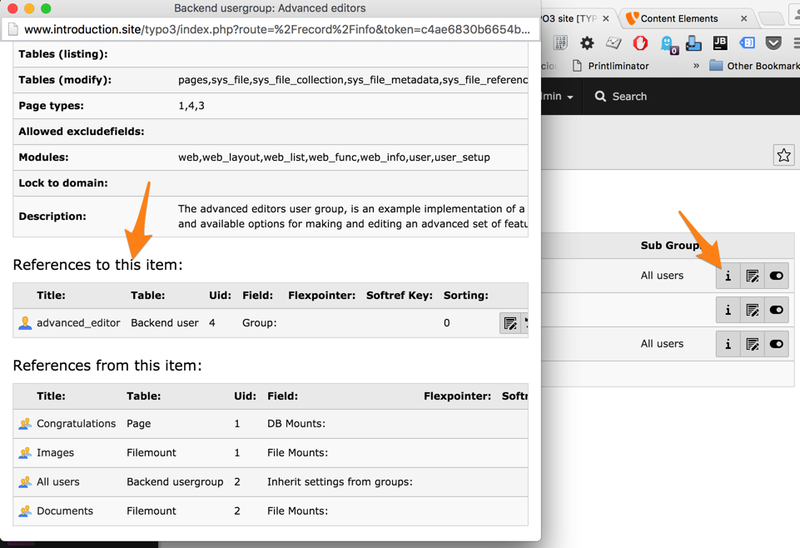 This chapter provides just a quick overview of backend user groups. In the next chapter we will look at changing user permissions using groups. We can see two groups that obviously correspond to our users ("simple" and "advanced"). To view which user is part of each group, the easiest is to click on the "information" action icon. A pop-up will open with detailed information about the group. Scroll down until you find the "References to this item:" section. This shows the list of backend users who are part of this group.